This past Saturday I ran my very first 5k race and had a blast! My friend (left) and I were on the road for the Color Me Rad 5k outside of Boston by 4:45am, and were running by 8:10. The course was on the Brockton fairgrounds and was AWESOME. 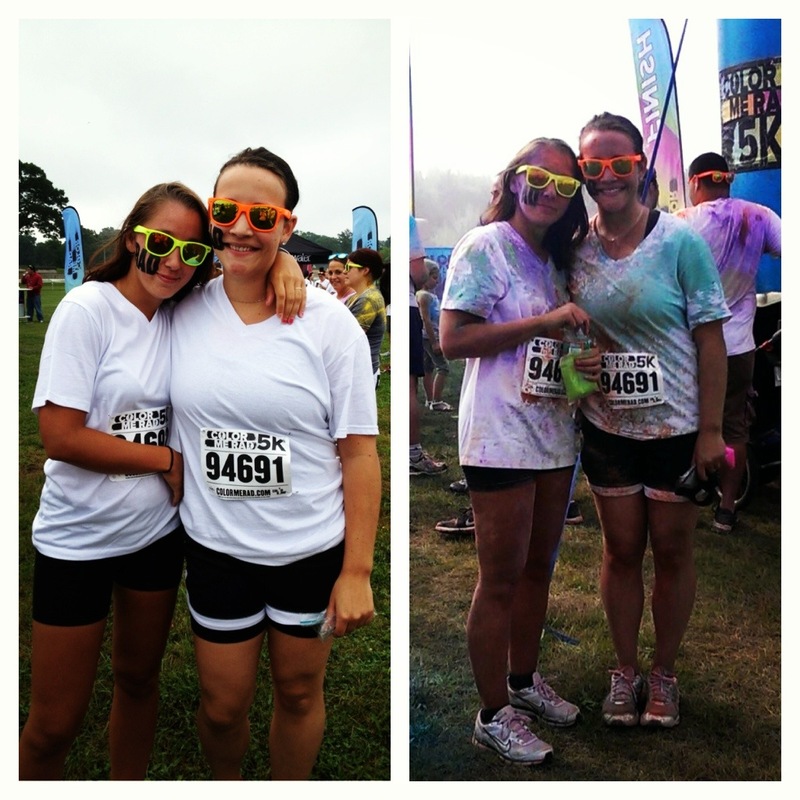 During the run, there are “Color Bomb Squads” that throw/squirt you with paint as you run by. You start off in white and end as a multi-colored awesome mess. We signed up for it about 3 months ago, and the experience alone was SO worth the $40 donation to the Special Olympics of Massachusetts. In addition to a good time, you get an awesome blue t-shirt with the Color Me Rad logo, a pair of fluorescent sunglasses to keep the paint out of your eyes (super smart idea), a “RAD” tattoo, a paint packet and the race bib. There were about 10 heats and hundreds of participants in each. Prior to your race time, there was a stage area set up where a DJ would hold contests, play music and throw paint bombs into the crowd to get everyone hyped up. During the race, there were 5 “Color Bomb Squads” set up at different points, where they would throw handfuls of powdered paint at you or squirt you with dyed water as you ran by. I went out of my way to run directly in front of the hoses to cool off. Though I had been training for it, I was still nervous that I wouldn’t do well or that maybe I wouldn’t be able to run through the whole thing. I tend to start too fast, ruining my pace. I surprised myself by running the whole thing and feeling like I could have kept going! I actually ended up running most of the race on my own, jogging the first half so my friend wouldn’t lose sight of me when she needed to walk, and then finishing a little faster about 1.5 miles in once I did actually lose her. I finished at 34 minutes and some change, which I think I could probably have cut down to about 30 if it weren’t for the jogging or the color stations (where the crowds tend to slow down a little). My brothers, who are both avid runners, told me that 34 was a great time for a first time 5k themed run. Nice to hear! I am so happy with how I did. Feels good to meet a goal! I am already thinking about which race I am going to sign up for next! I need something else to train for! Congrats on your one of many future fitness accomplishments! It’s been awesome watching your fitness transformation! Keep up the great work!